Chef Floyd Cardoz on a beach in Maui. The above photo from the 2014 Hawaii Food & Wine Festival event, “Under the Maui Moon,” is one of my favorite photos that I have captured while working with the festival. 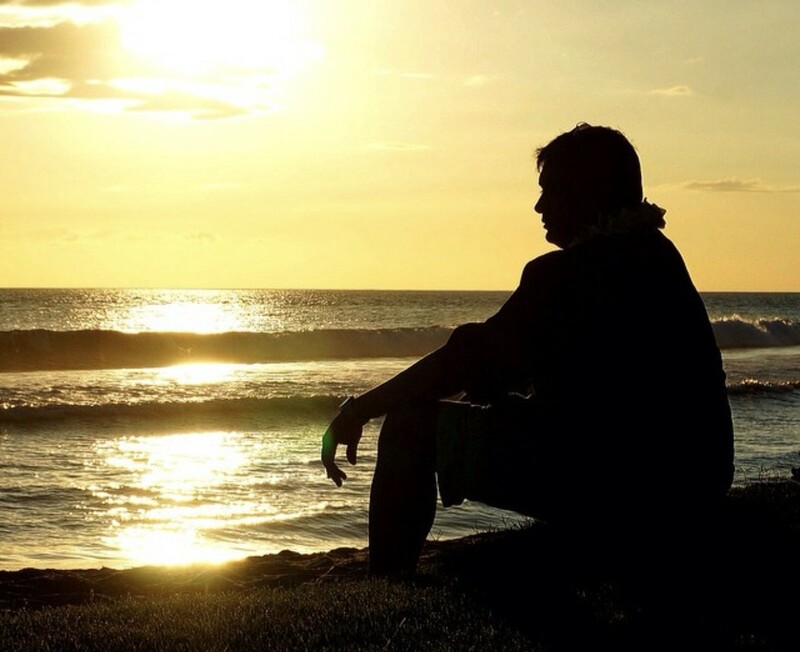 Taken just before the start of the event, Chef Floyd Cardoz takes a moment on the beach to enjoy the ocean sunset. In that moment on the beach, Cardoz had just finished a phone call with his son, and was thinking about him while watching the sunset. Cardoz requested that I send him the photo, to which I gladly obliged. 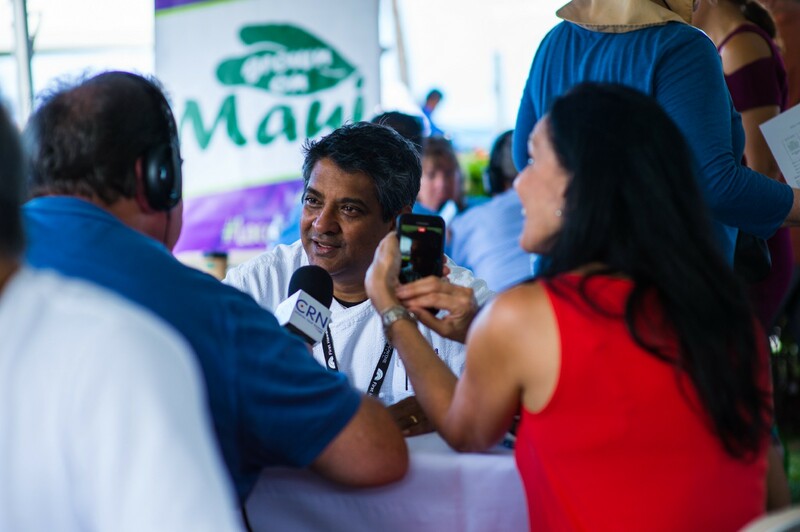 Chef Cardoz returned to Maui for this year’s Hawaii Food & Wine Festival “Lucky 7” event. I took this opportunity to reconnect with him to find out his creative process in this edition of Anatomy of a Plate. Hearing Chef Cardoz explain his process, I get a sense that he doesn’t conceive dishes, they flow from deep within his soul. 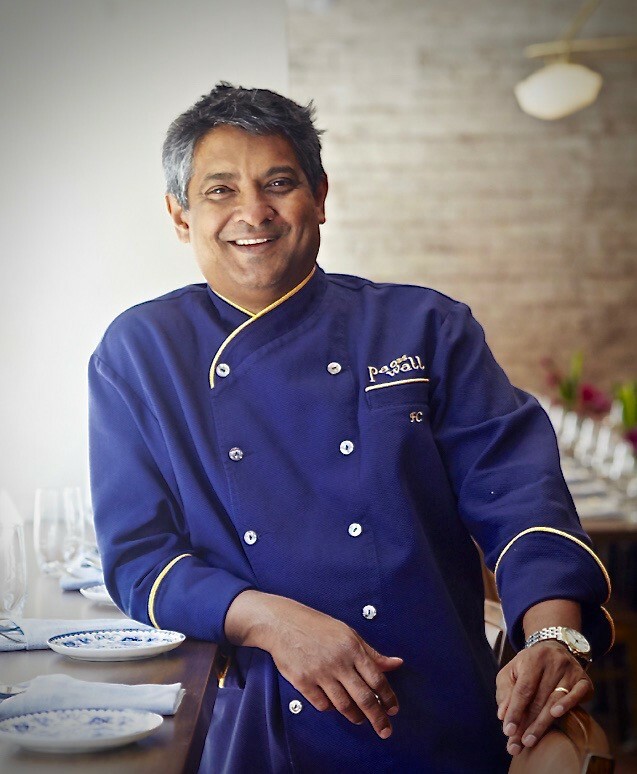 From beginning to end, Chef Cardoz’s process doesn’t take very long. He’s purely ingredient driven, and dishes often go straight onto the menu without any experimentation or testing. 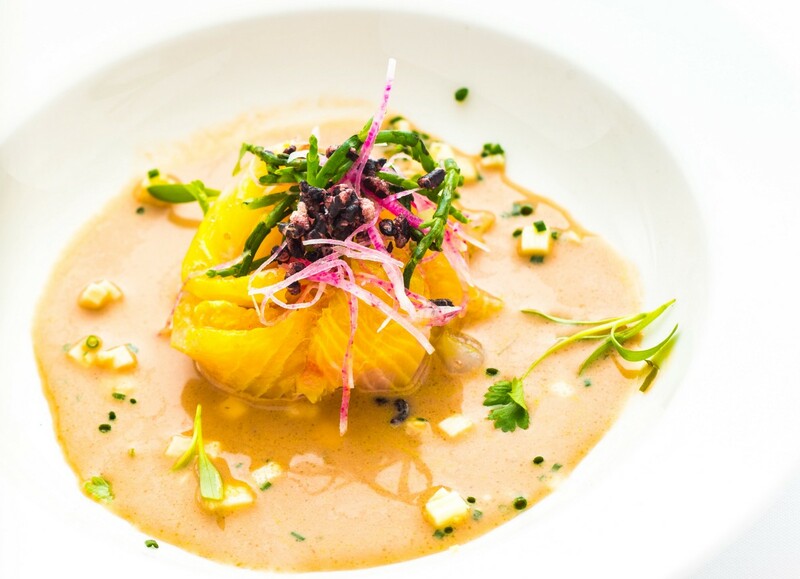 Even his dish for the Lucky 7 event, cold kampachi with coconut froth, chilies and hearts of palm, was not finalized until he arrived in Hawaii. The addition of heart of palm came about in a more roundabout way. The example Cardoz uses to explain this starts with an unexpected dish, duck a l’orange. 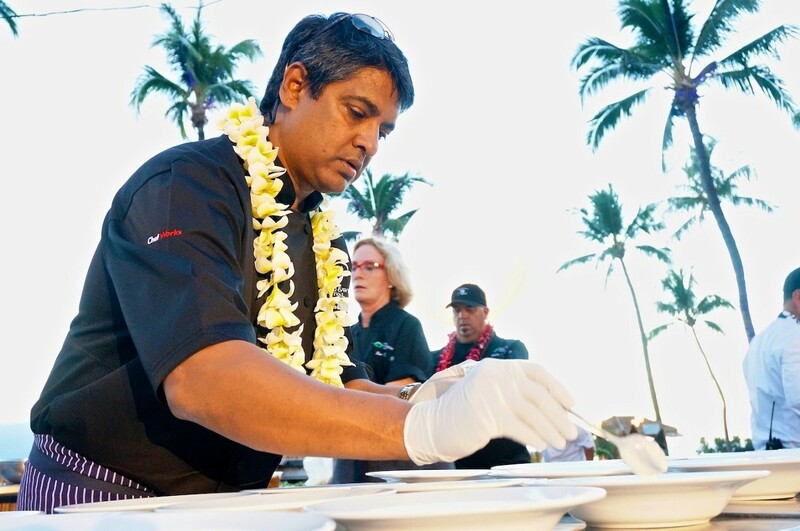 Chef Cardoz plating at the 2014 Hawaii Food & Wine Festival. As he plans out the flavor profile of his dish, he doesn’t look for flavors that are usually paired with kampachi. Instead he looks for less obvious combinations by using coconut as a bridge between the two flavors. If heart of palm pairs well with coconut, and coconut pairs well with the Kampachi, then in theory, heart of palm should pair well with kampachi. “Inspiration for me comes from ingredients mainly. However, there are times when I’m eating somewhere, it can trigger an emotional memory of another dish. A lesson that Cardoz was taught a long time ago is the adage, “less is more.” It is a philosophy that has become the root of his creative process. Cardoz avoids putting too much on the plate. Too many levels of sweetness, heat, acid, or bitterness, can lead to palate fatigue. Because he doesn’t like palate fatigue in the food that he eats, he designs his dishes so that his guests don’t feel the same. Chef Cardoz innovates from an emotional place within himself, therefore, he has to occupy a proper space in order to create. When I taste food, the place that I go into in my head is whether what I am eating is better or worse than something that I could make myself. If it’s better, I ask myself, how would I duplicate it. The best goat cheese flan I have ever had was at Andina Restaurant in Portland. After tasting it, I sought out and tweaked a recipe until I was able to produce something that was just as good. If I taste something that is worse than something I can make, then the question becomes can I improve this dish? When I mentioned this to Chef Cardoz, he said something that caused me to pause. In that moment, I recognized that I over think food way too much. Regardless of which rabbit hole I dive into, I am not fully present with what I am eating. I become so preoccupied with deconstructing the dish in my head, that I’m not experiencing the dish for what it is. I am asking the wrong questions. By fixating on the effectiveness of it, I fail to empathize with the person who created the dish. 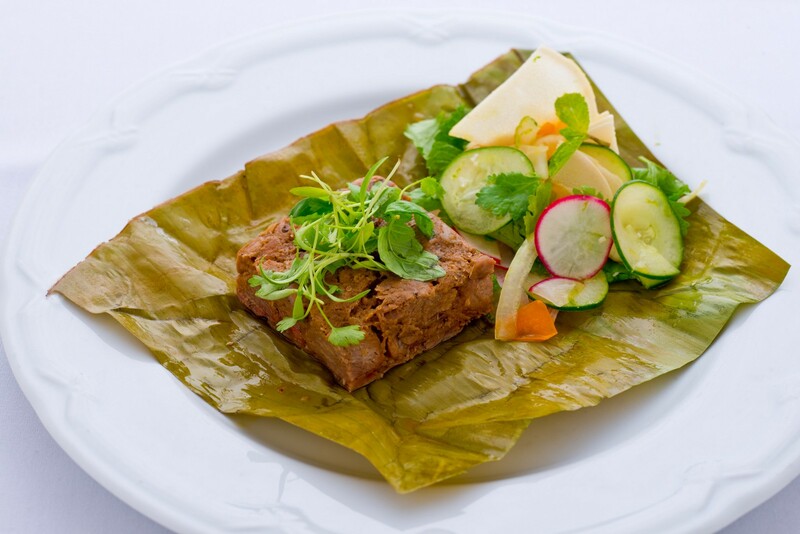 The question that I should be asking is, what is the chef attempting to invoke with this dish? When I emotionally connect with the dish, I emotionally connect with the chef. Not overthinking is a great practice to follow when creating a dish, and it is also valuable advice to adhere to when eating.